Japan is a country built on traditions that stretch back centuries and which can still be seen clearly in everyday life. Respect, courtesy, and politeness are basic principles in society, and good service comes as standard without the expectation of extra compensation. Japan quite simply doesn't have a tipping culture, so trying to leave a gratuity could result in a fair amount of confusion. That confusion will inevitably lead to attempts to give you back your change, and could even open up the potential for causing offense. Avoid an awkward situation with a heartfelt thank you instead. China is such a vast country with such a diverse history that many aspects of life differ drastically from region-to-region. The food, the landscapes, and even the language vary depending on where you are. But one thing that remains largely the same is that tipping is unexpected and unnecessary. 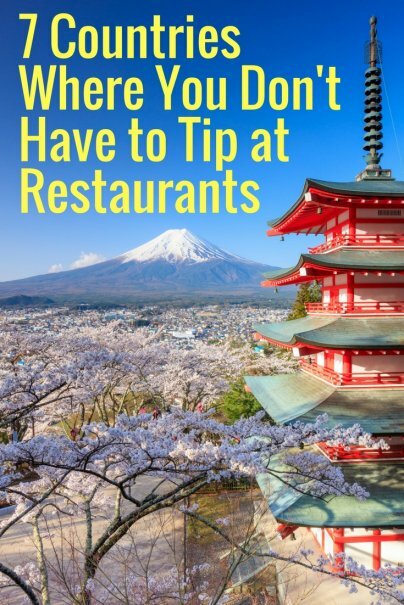 Similar to Japan, China has no tipping culture traditionally, though in some of the big, international destinations it is becoming more common, largely thanks to overseas visitors. In Hong Kong and Macau, restaurants will often include a 10 percent service charge. If you feel you got exceptional service you may want to leave a little something extra. I lived in a relatively unknown city called Yangzhou for one year, and when I first arrived, my North American habits meant that I was frequently leaving tips without really noticing. I soon realized that this was not a custom in Yangzhou, and often the waitstaff would chase me down the street to return my change to me! This collection of magical tropical islands in the South Pacific Ocean might be an overseas collectivity of France, but the tipping rules are slightly different from the country that oversees it. Tipping traditions here stem from Tahitian traditions rather than the French customs. In France, a service charge is included in the price of meals, and is required by law to be passed on to the staff. Additional tipping is not an obligation, but is accepted as a gesture for good service. In French Polynesia, no tip is required ordinarily, though if one is expected it will usually be clearly indicated with a note on the receipt to say that it would be appreciated. Switzerland is a country whose identity is heavily influenced by the countries surrounding it, with French, German, Italian, and Romansch all considered official languages. Its tipping customs are unique to Switzerland, though, as there is no expectation to leave a gratuity for any services received. Tipping in Brazil is not common practice, partly because culturally it's not been done, but also because a 10 percent service charge is usually automatically added to your bill. Having said that, tips here are genuinely appreciated, even if they're not relied upon. Many customers tend to round up to the nearest real rather than waiting for small change, and don't be surprised if service staff do this as well when giving you your change back. Use your discretion as to when to give a tip, but remember that waiting service is a well regarded profession here and anything you do leave will be well received. South Korea is a country that manages to seamlessly merge age-old tradition with cutting edge modernity. Its vibrant capital Seoul is a mammoth metropolis with a thriving food scene, futuristic architecture, and streets full of trendy fashionistas. Outside of Seoul there's an abundance of stunning natural landscapes that will take your breath away. Regardless of where you are in South Korea, tipping is generally not expected, though it may still be appreciated in certain settings such as more westernized restaurants. In some instances it can even be considered as an act of pity rather than generosity, and may be refused. The easiest option is to simply not tip. This stunning Scandinavian country, like many others in this region, is well renowned for its egalitarian social policies. Its relatively high minimum wage means that service staff are well compensated for their work. Add to this the fact that a service charge of 10 percent is more often than not included in your final bill and it goes some way in explaining why tipping is so uncommon here. Don't feel obliged to leave a tip, but if you do receive great service, a tip is taken as a token of your appreciation. It's also more common to tip in higher end establishments than it is in cafes or bars, but still not considered a requirement. Five to 10 percent is sufficient if you do decide that you want to leave something. In the U.S., tipping is such an ingrained part of the culture that it can feel strange not leaving a gratuity, particularly when you've received great service. But whether you feel comfortable resisting leaving a tip or not, it's important to follow the customs and traditions of the places that you visit. What you consider a harmless and even generous act could be seen as completely the opposite and cause offense to the intended recipient. Be respectful, and if in doubt, feel free to discreetly ask what the expectation is.